Save Marinwood-Lucas Valley - our community, our future: The "Improvements" to Sir Francis Drake will put you in a Traffic Jam. The "Improvements" to Sir Francis Drake will put you in a Traffic Jam. 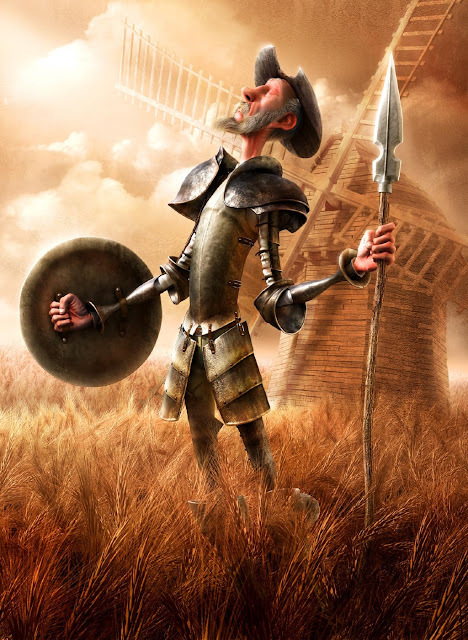 Don Quixote "fixes" Sir Francis Drake. Our County has rather quietly put together a plan to help alleviate traffic on Sir Francis Drake Boulevard. Well, at least that’s the stated goal. The plan has been developing below most everyone’s radar and that’s seldom a good sign. $13.2 million will be spent on SFD between the Ross-Kentfield Line and the Bon Air Shopping Center. Half of this goes to repaving. The remainder buys relatively little but potential headaches. The existing surface on this stretch of SFD is in far better shape than most Marin roads. But the money’s allocated and hey, it has to be spent, even wastefully. I think most of us know the backups on SFD in that sector are really caused by the bottleneck at the 101 interchange and the lack of that third lane on the Richmond Bridge. But not one dime of the $13.2 million goes to fixing that. The repaving and “improvements” will take two years to complete. That means two years with conditions even worse than they are now. And what are those “improvements” that will result from this extended test of our patience? Bike lanes are high on the list. That's ludicrous for several reasons. The road isn’t wide enough without further narrowing the existing lanes for motor vehicles, which will slow traffic, and likely result in accidents. Bicycles account for less than 1% of traffic on SFD. Cars, commercial vehicles, public transport and motorcycles account for more than 99%. So, we’re going to perhaps get bicycle usage up to 2% at the enormous inconvenience of the 98% - motorists and riders of public transit? And do this in spite of there being a perfectly good bike path close by along the Corte Madera Creek? OK, there’s a gap in between Bon Air Road and the end of South Eliseo Drive, but South Eliseo has relatively little traffic and bikes are easily accommodated. “Bulb-outs” may be built at some intersections. These take away right-hand turn lanes and have a very detrimental effect on traffic flow. More crosswalks are in the plan. Even a crosswalk at Wolf Grade, as it seems some of the kids at Bacich Elementary School don’t like climbing up the stairs to the pedestrian bridge. Maybe their parents didn’t tell them about how they had to walk miles to school in the snow. Barefoot. As we ponder whether any of this will be money well spent it’s important to keep in mind that this section of SFD is District 2 Supervisor Katie Rice’s turf. Both she and District 4’s Steve Kinsey are on record for opposing the addition of a second level of parking at the ferry terminal because they don’t want to encourage all day parking. They want you to find your way there by public transportation or by bike. Anyway, underneath all this is the political goal to get us out of our cars. Kinsey just announced he is not running for reelection next June. But Ms. Rice is. You have until Friday Dec 11 at 5 pm to comment. Here is a promotional video for Traffic Calming. As you can see, the improvements they want to do to Sir Francis Drake Boulevard are meant to SLOW TRAFFIC and create even more CONGESTION so people will magically switch to taking public transit, bicycling or walking.